The Raloy 15", 17" and 19" Rack Mount LCD Monitor Drawers are 1U high (1.75") pull out trays equipped with a high resolution, wide viewing angle 15", 17" or 19" LCD. 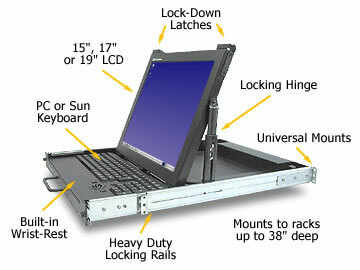 The unit is designed to fit in a standard 19" rack and to be slid out for use. Using a Rackmount LCD (RA15-sun-serial) in your rack allows you to have more space and use your rack more efficiently - save space...save money.